Happy Sunday Dies R Us Friends! Darlene with you today sharing a creation using a new March Release Birthday die that you will definitely need for your own! 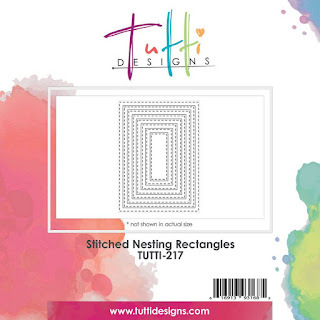 I've also used another die that I find myself using over and over again ... the Nesting Stitched Rectangles. 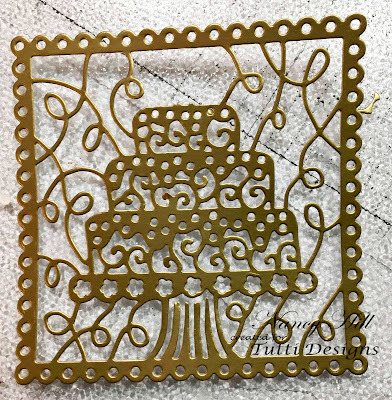 Only a couple of the so many fabulous dies available at the Tutti Designs Store. 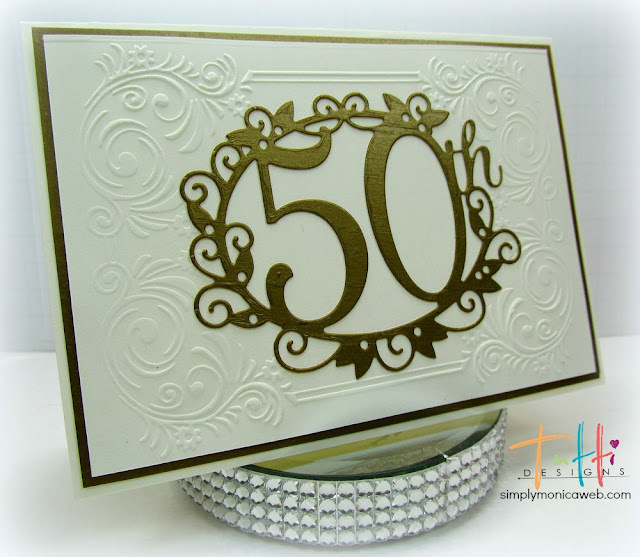 I've had this fabulous Birthday Present die cut from white card stock and sitting on my work table just waiting to be turned into a card and today's the day! Once again I have turned to my box of scrap papers to use. I had a large scrap of this pink designer paper so decided to use it as my background as well as the 'wrapping' on my presents. Since it is a double sided paper it worked perfectly. Just a little fussy cutting and my presents are 'wrapped' and ready for giving! Plus I popped it up on the green panel (which was cut using the Tutti Designs Nesting Stitched Rectangles die set. 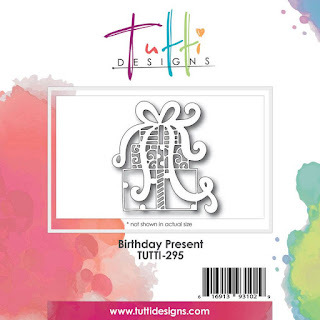 And, I also used the Tutti Designs 'Happy' and 'Birthday' dies for my sentiment. Please be sure to pop over to the Tutti Designs Store and check out all of the fabulous dies in this release. And, of course, you'll want to browse through the store to see what other dies you need to have on hand. but I didnt have any gold colored paper. So, I was looking through my stuff and found some gold washi tape from ADORNit and thought ha! Simply lay your washi tape out in perfectly lined rows as seen in the first photo and simply diecut. You will be amazed at how perfect it comes out. You cannot even tell it wasn't paper. Next lay your washi tape in the size needed to mat your card front to and cut to size. Below is a close up so you can see how well the washi tape works with the die. Here is my completed card and I hope everyone has enjoyed my post for today. Happy Anniversary with the beautiful Bird Tapestry. Today's card I have gone back to my favourite Shabby chic look. Today is Bird Tapestry, TUTTI-164. 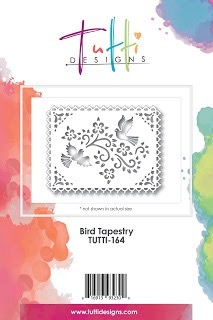 Cut the Bird Tapestry from white pearl card. Distress ink the edges with vintage photo. 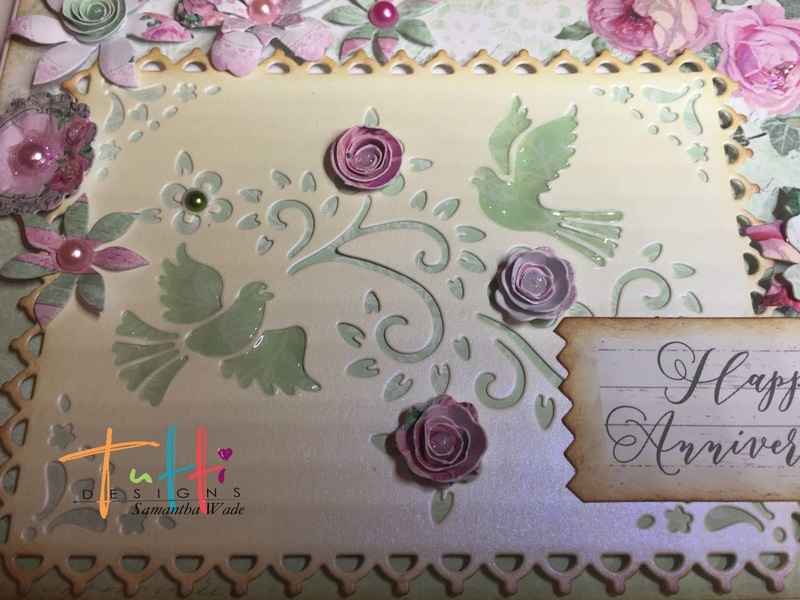 With 3D foam layer the bird tapestry onto Decorative paper, which is Shabby Chic collection from Craftwork cards.Then fill the birds in with Glossy Accents to make them look resin. 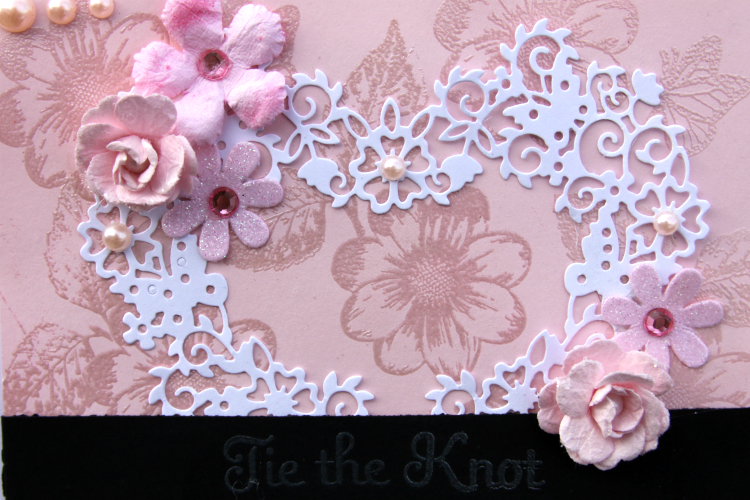 Add a message to the side, Arrange the paper flowers, then a few pearls, to finish. This die panel cuts so well and makes beautiful quick cards. the store and check out all the new releases! 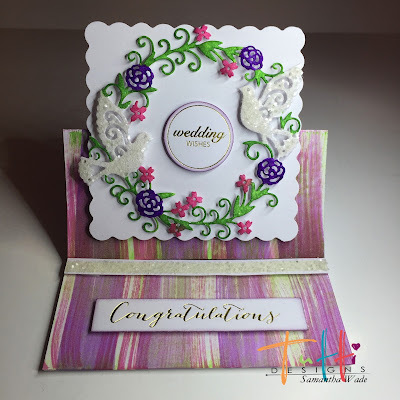 I make a lot of wedding cards and always need them, its one of those occasions that sneak up on you when you are least prepared. 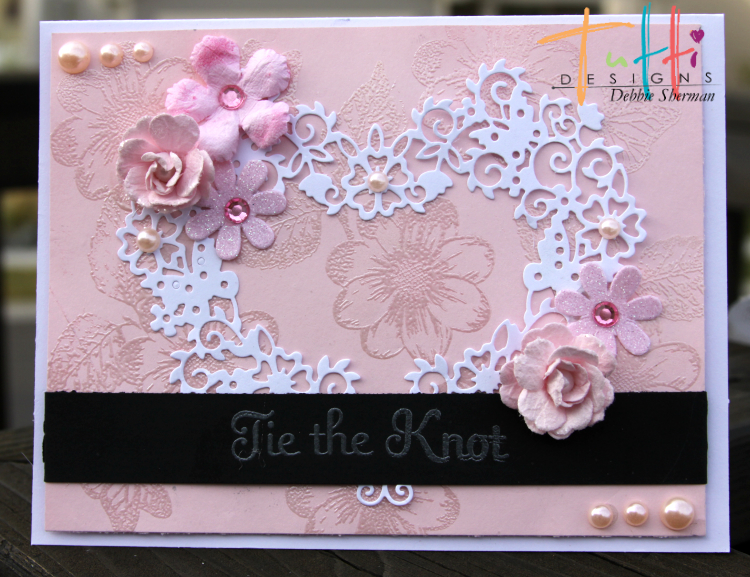 They tend to take me more time to make but the card I'm sharing today can be made pretty quickly. August Release of Flowery Heart. To make this card I started out by stamping the background using Versa Mark and some flower and leaf stamps I had in my stash. These are by Bo Bunny. The next step is to emboss with Pearl embossing powder. It gives it the perfect shimmer. 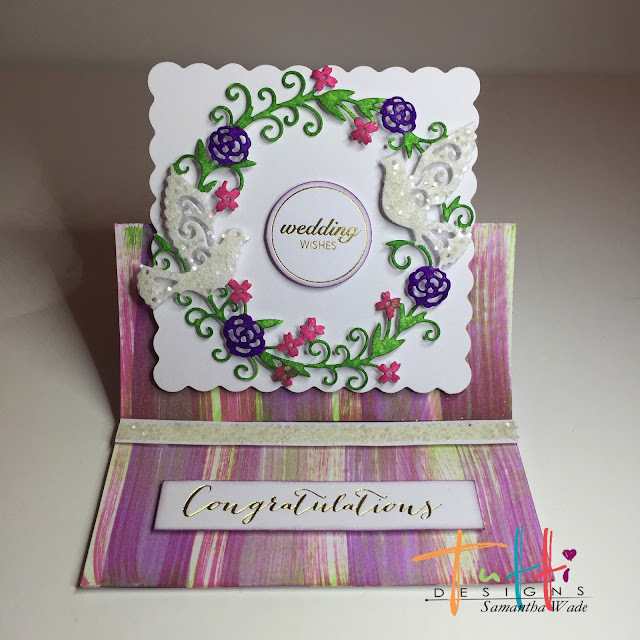 The next step is to stamp the sentiment using the same ink and embossing powder. I stamped on black card stock and made a belly band and tucked my die cut Flowery Heart under it before adhering on the back of the pink card stock. Adhere to your card base. 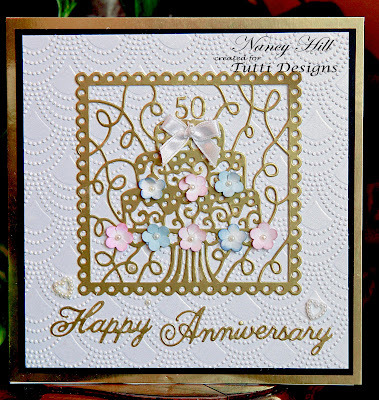 Embellish with Pearls and Flowers and your card is done. 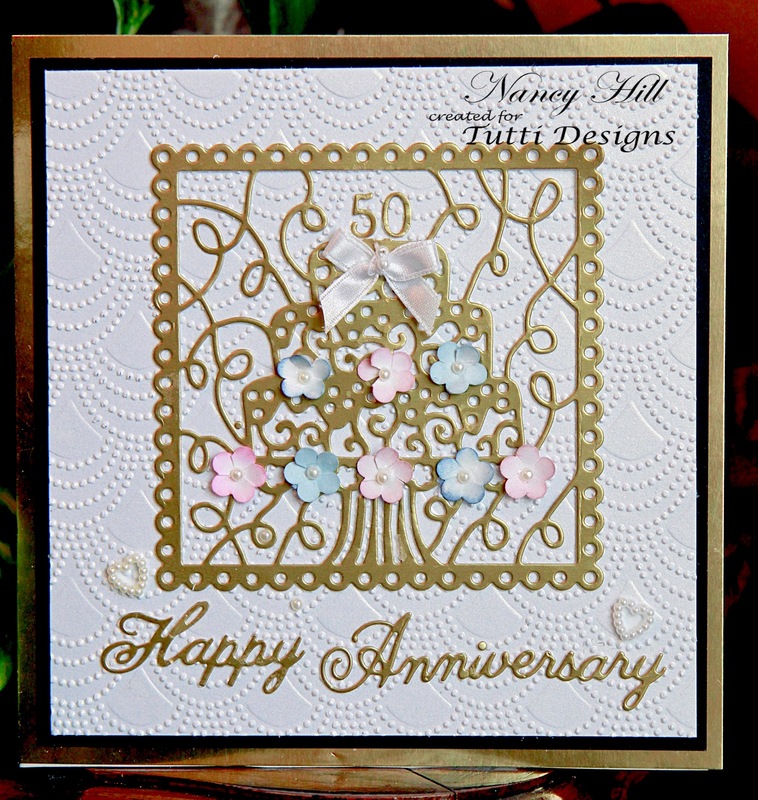 Thanks for stopping by Tutti Designs blog today! Autumn here and I am giddy with excitement today as I share this very fun and whimsical child's birthday popup card with you! Not long ago I pinned THIS coffee monster from Useless Trinkets. To my surprise the page was loaded with fantastic free digital images. 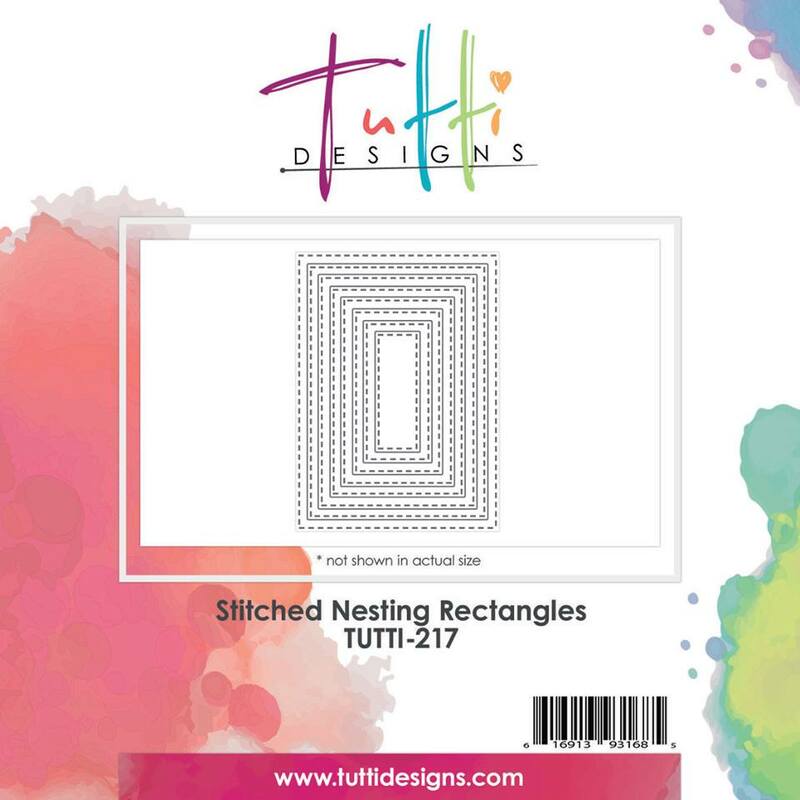 I found this fun party monster and printed them out in a few sizes, hoping that one would work well with my Nesting Stitched Square dies. I ended up fussy cutting the image for some extra dimension and used patterned paper for my squares. I colored him with colored pencils. Our March release is filled with amazing birthday themed dies, including this Balloon Corner. 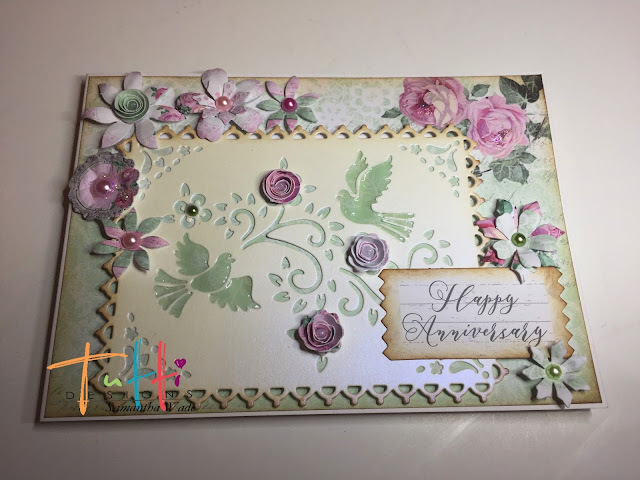 I cut Basic Grey grunged solid paper from the front side and back side to make a mirrored set, then cut a couple of white watercolor images as well to make a shadow and give some stability to my popups. This card measures 5x7". To form the popup, I simply scored the top of the card in half. I mounted the popping layers beneath the score line. I added patterned paper to the top half so that it would be pretty when on display and also when laying flat. I have to tell you my nine year old niece LOVED this card! What fun! 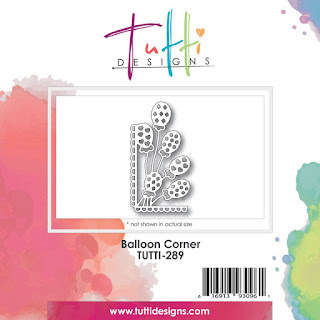 Purchase your Balloon Corner die today HERE! While you're hopping around visit these sites and have a great day! 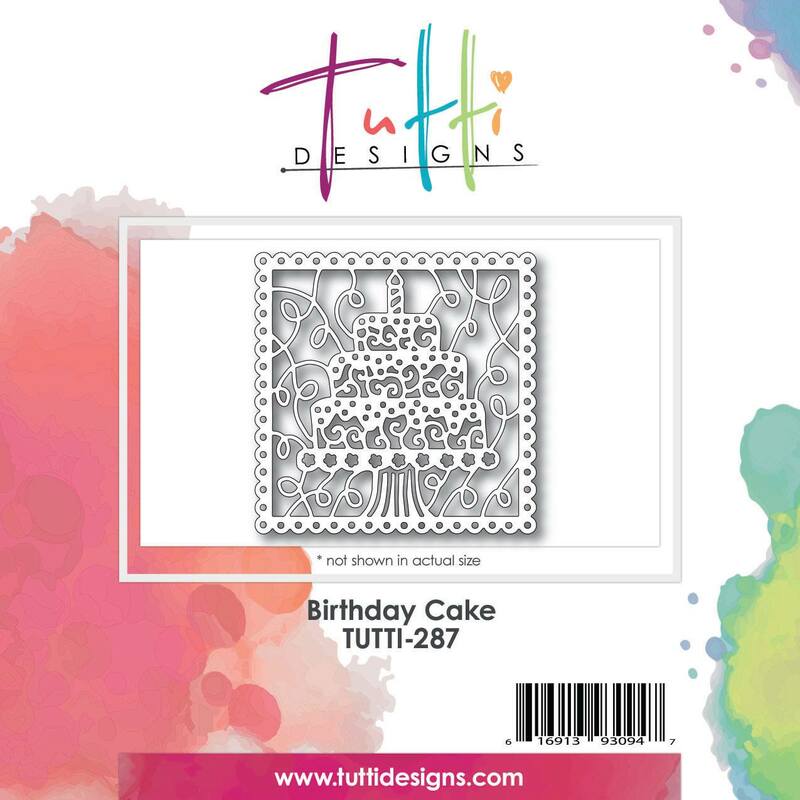 This one is from the March Release, which is all about celebrating and birthdays. It's called Birthday Present, and you can find it HERE. and then placed it on a white Nesting Stitched Rectangle Die. I mounted the whole piece onto the background with foam tape. Finally, I added one pretty red rhinestone. And here's my card creation . . . 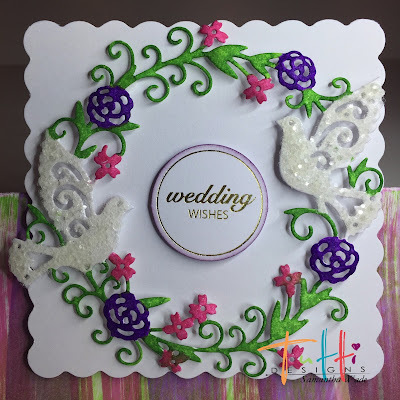 I recently purchased the new Tim Holtz Distress Oxide Inks and while I was playing around with them I thought the panel I had created would be beautiful for an Easter card. 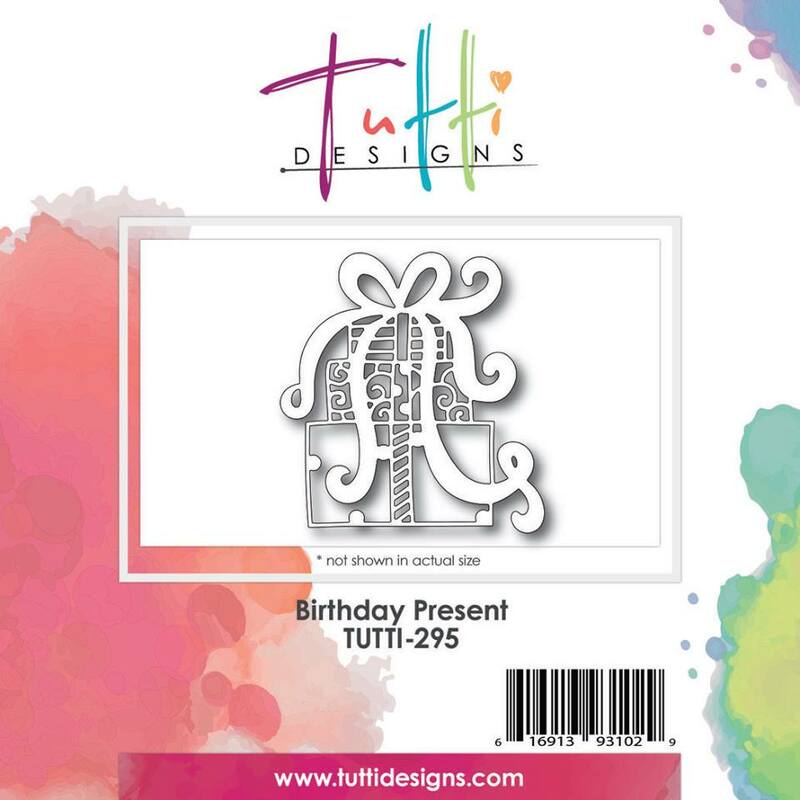 Immediately I knew this Tutti Designs die would be perfect for the job! And I'm thrilled with the outcome. I wanted the Happy Easter sentiment to POP on my card front so needed to create a solid backing but didn't want to mat the entire circle ... I still wanted the matte Easter colors to show through the design. So I simply took a scrap piece of purple card stock ... cut/glued it to the straight strips above & below the sentiment then lifted the left & right sides to trim away. A little dab of glue on either end and it was ready to adorn my card front. Once I had it positioned where I wanted on the card front, I added a few Nuvo Crystal drops here & there on the flowers, a purple gingham ribbon / bow and it's ready to mail. 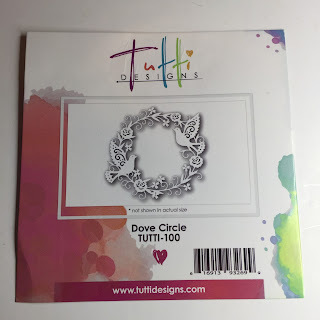 Today is Dove Circle, TUTTI-100. 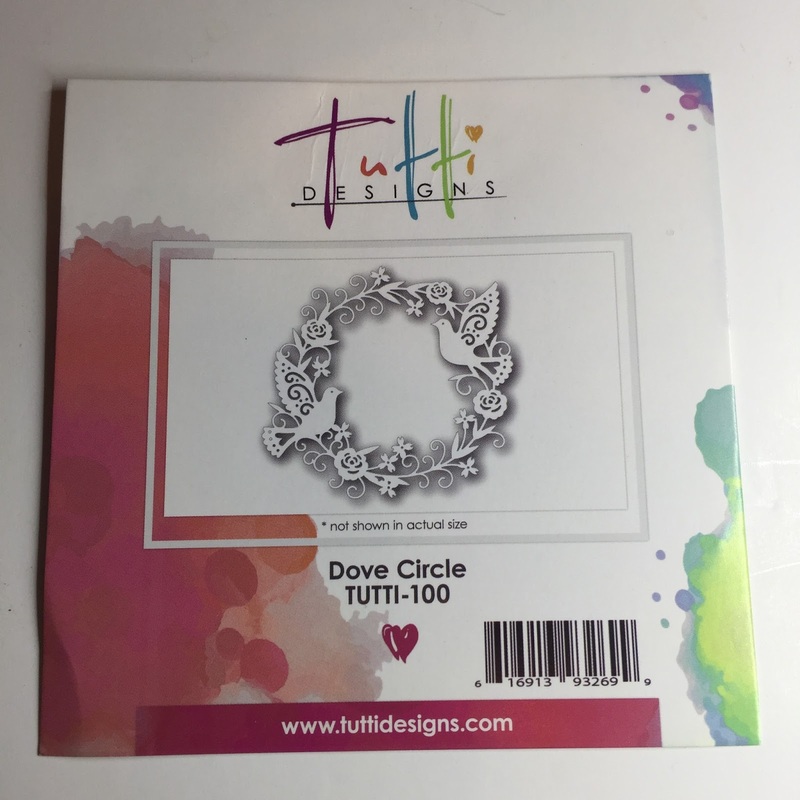 Cut the Dove Circle from white card and colour in. I used Wink of Stella, Violet, Green and Dark Pink. Used a mat and a ball tool to give shape. Then covered the doves in Glossy Accents and Iced Snow Glitter Jewels. 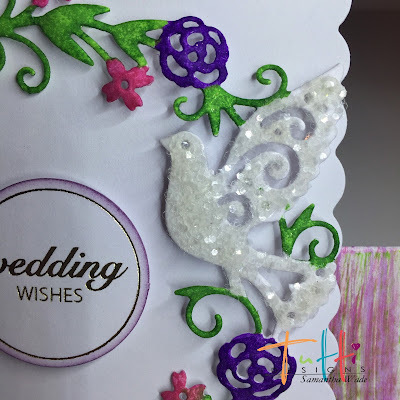 With 3D foam layer the Dove Circle onto a scalloped square. 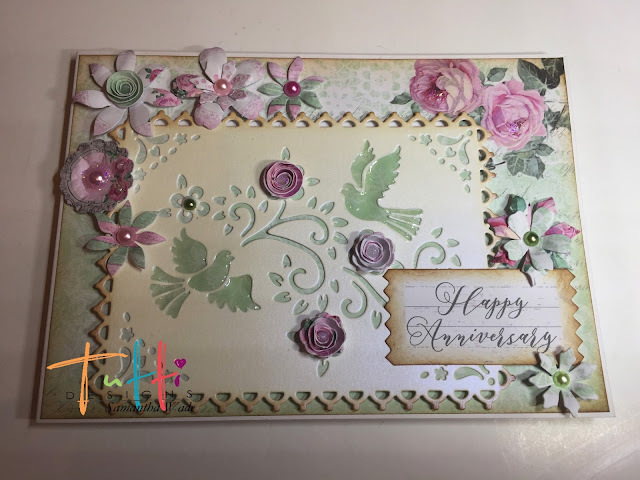 Add a message to the centre, wedding wishes seamed perfect. The background of the easel card i made with the three colours of Wink of Stella and added to a glass mat then used a large flat brush to swipe across the card. This die is one of my favourites, it cut easily and is so lovely in any colour.